We just got our feedback from the VIBES judges, there are some really useful pointers for where we are doing well and where we can improve. Who knows, maybe if we keep up the good work we will be in line for an award next year! On entry in to Film City Glasgow the environmental notice board was very visible, there are also self-designed posters reinforcing projects on sustainability present throughout the building. 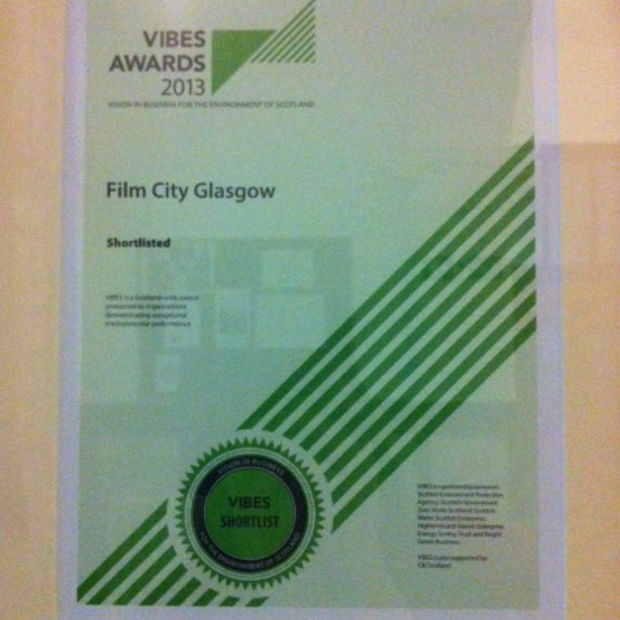 The Environmental Policy was written and developed collaboratively between all Film City Glasgow staff and tenants. Film City Glasgow set up a green team and carried out an exercise with tenants where they highlighted sections areas they felt should be included in the Environmental Policy and worked for the overall business. There are clear future ambitions to help influence the film industry in Scotland and beyond and become more sustainable. The environmental group will encourage long term tenants to fully engage and participate in the agenda. There is also the tenant’s quarterly sustainable group, where participant organisations receive a reduction in charges for participation. Through working with the carbon trust a number of initiatives have been developed including smart metering. This allows utilities to be monitored on a weekly basis. Film City Glasgow intends to use automatic meter reading systems recorded through an online database. Social benefits include working with Glasgow Film Theatre to promote ‘green’ events and running a Community Engagement Event (Litter Picking day). The company have held some informal evenings with tenants on sustainable themes for example ‘keeping bees’. Film City Glasgow intends to use successful outcomes from their Programme for Sustainability and replicate them at the site of the proposed Glasgow Film Studio project. The company has a lot of ambition to influence the film industry in Scotland to be ‘greener’ and this should be applauded and encouraged. While the participation arrangements relating to reduced charges is innovative, more could be made of tenants who are already green champions and get their leadership and buy in. The judges noted that tenants could see the green obligation as money saving by Film City rather than an ethos for the business and its partners. While there is anecdotal evidence that current tenancies have been retained as a result of energy improvements to the building, it is difficult to assess whether new business has been won as a result of environmental actions. While some of the information provided shows improvements in both waste and energy, it is difficult to interpret these in the absence of clear key performance indicators. The judges recommend greater interrogation of data and a decision route based on the results needs to be established. The judges would have liked to see the Environmental Policy on the notice board for all visitors to see, they understood a new policy was in development at the time of visit with a final version due to be completed in October. There are opportunities to promote the company’s sustainable agenda on the website more. We have taken these recommendations on board and we are making improvements to our website accordingly. We have also printed off our Environmental Policy which is now pinned on the green notice board. We are looking forward to a sustainable year and more awards for 2014!